Have you been feeling a little off or just not yourself? When you’re not your best, you might be able to figure out why by simply sticking out your tongue. When you visit my dental office in Lewisburg, we’re always on the lookout for any bumps or discolorations, just like your primary care doctor. Here are a few reasons why you should always keep an eye on your tongue and discuss any changes with us! Bumps, cracks, discolorations, lines, even “hairs” – these are all things you’ll want to keep a keen eye on when you stick out your tongue and take a look. Make it a habit of checking out your tongue every day when you brush your teeth. Take a moment, open up, and say “ahh.” If you notice any unusual symptoms that seem to persist for more than two weeks, it’s a good idea to give your dentist in Lewisburg a call. These are just a few of the most common signs your tongue may be giving you about your health. It’s just as important to use common sense and call my Lewisburg dental office if you suspect something is not right. When your tongue and teeth are healthy, the rest of you will be too! Accepting new patients from Lewisburg, Selinsgrove, Williamsport and beyond. By now you probably know that the human body is made up of mostly water, and we need to drink plenty of it each day just to keep our organs and other important parts functioning properly. At my dental office in Lewisburg, we understand how important it is to stay hydrated at home, at work, and on the go. That’s why it’s super easy and convenient to grab a water bottle or bottled water and keep on chugging along. Bottled water has surged in popularity over the years for a variety of reasons. But did you know that if you and your family drink solely bottled water and no tap water, you may be missing out on fluoride? Water is essential to your body. You cannot live without it. Did you know it’s responsible for maintaining all of these things? Experts recommend that you drink about 8 to 10 cups of water daily! This may change due to weather (hot temperatures) or your body size. Fluoride is a naturally occurring mineral that has been proven to help prevent the onset of tooth decay. It helps protect your teeth’s enamel from the damaging effects of sugars and acids found in so many of the foods and drinks available to us each day. Most public water systems have some level of fluoridation. This could occur naturally or some communities will add a small amount of fluoride to the water system to ensure residents absorb its benefits. There are some bottled waters that contain fluoride too, but most do not. How Do You Know You’re Getting Enough Fluoride? No matter what kind of bottled water you and your family chooses to drink, your Lewisburg dentist wants to make sure you’re getting enough fluoride in your diet to help keep teeth strong and healthy. If you’re drinking mostly bottled water be sure to try and choose a brand that contains some amount of fluoride. 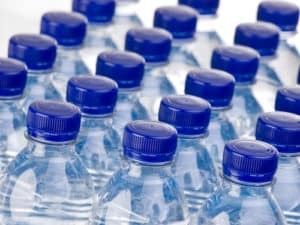 The Food and Drug Administration doesn’t require companies to show how much fluoride is added to bottled water, unless it’s been intentionally added. If you want to find out how much fluoride is in your bottled water brand, it’s best to contact the company directly and request that information. The American Dental Association says water should have around 0.7 to 1.2 ppm of fluoride, with one ppm being equal to 1 mg/L. It’s always a good idea to make sure you take whatever steps you can to keep teeth happy and healthy. This means making sure you’re getting enough fluoride. Don’t forget that most kinds of toothpastes contain fluoride too, which can give your teeth a boost in fighting off bacteria causing decay. Do you have questions about fluoride? My Lewisburg dental office can help. We’re ready to listen to your questions and your concerns. Just give us a call!